CUB VOLUNTEERS help to construct a house in Baja Mexico in 2015. This December marks the first time two builds will take place. Two Loyola Cub Construction Christmas Baja Builds will take place from Dec. 27-30. 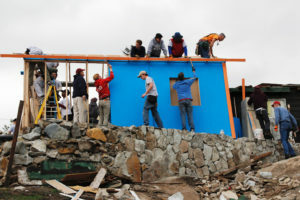 Twenty-seven students and their fathers will be constructing durable and much-needed houses in Tecate, Mexico with the help of Baja Christian Ministries. Loyola started building homes with BCM about eight years ago with the help of former Cub father Chris Laubach. He leads the Baja Builds and introduced Loyola to BCM. With the help of students and their fathers, the BCM has been serving the spiritual and physical needs of the poor by forming short-term mission teams to build houses in Baja California. This year marks the first time that there will be two separate build dates in December. The first team leaves for their two-day immersion the morning of Dec. 27, and the second team leaves on Dec. 29. The students will depart from Loyola at 5:30 a.m. and travel to the Otay Mesa crossing at the US-Mexico border. The Cubs and their fathers will then meet with the BCM representatives once in Mexico. They will then proceed to the build site located in the Colonia Rincon area, a deeply impoverished region located on the far western fringes of Tecate. In just two days, the Cubs will build a 16 feet by 20 feet, three-room, weatherproof home with a loft for a local family in need of housing. A concrete slab floor and construction materials are all provided through BCM. Construction tasks will include framing, wiring, roofing, painting and drywall. When the Cubs are not building, they will be resting at the Hotel Estancia in Tecate and eating authentic Mexican food at a local restaurant, Tacos Las Dumas. The next morning, the Cubs will eat breakfast at the hotel. Work will typically be completed by the early afternoon culminating with a dedication ceremony around 2 p.m. After talking to the locals and reflecting upon the completed work, the Cubs will then travel back to Loyola and will arrive around 6 p.m. Within a week of opening the sign-up applications, the two build teams were full.